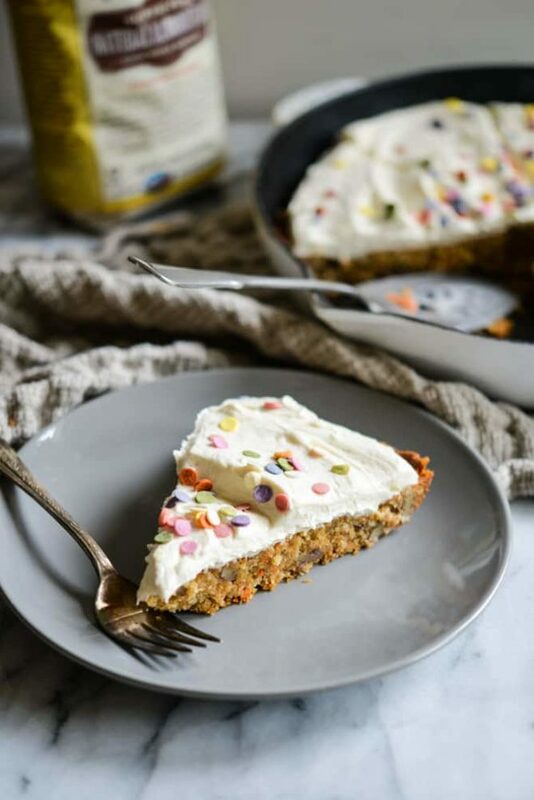 This Easter Carrot Cookie Cake has a Paleo almond flour carrot cookie base and a luscious cream cheese frosting! It's the perfect festive treat for any Springtime gathering. This may be the most festive dessert I've ever published! 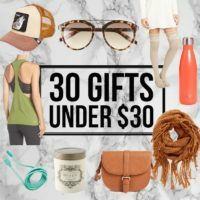 With Easter around the corner and our own little girl now here, I find myself wanting to celebrate holidays in an even more fun/festive way. Though it'll be a few years before she'll be able to go on an Easter egg hunt, it didn't stop me from telling her a (made-up) story about the one time the Easter Bunny accidentally dropped his crayons into the egg pool …and THAT is how all the eggs got dyed different colors! She totally smiled, so I think that means she loved it. That, or, she noticed Gus sitting next to me and THAT made her smile. Either way, I'll take it! When she's even a few years older than that, I hope she'll join me in the kitchen while we work together to make some festive treats! 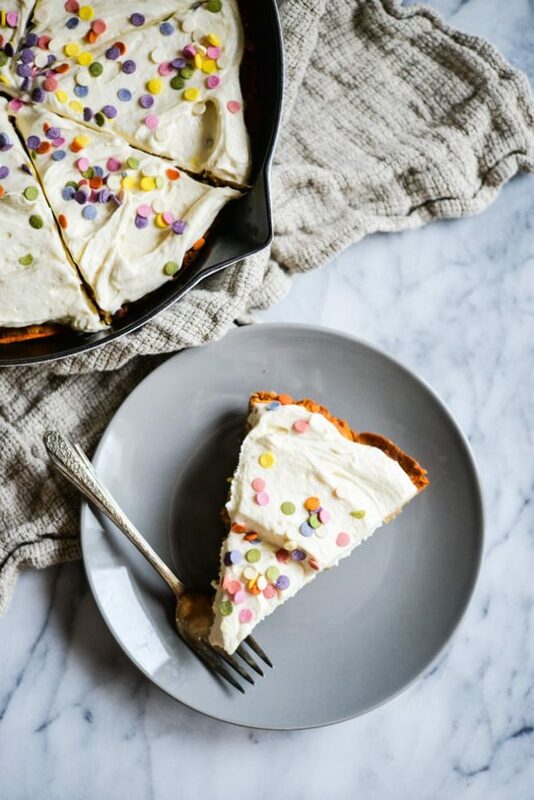 This Easter Carrot Cookie Cake would be a perfect project. 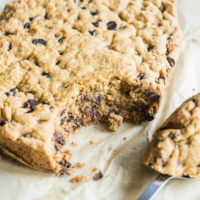 This cookie base is based on my fan-favorite Paleo Chocolate Chip Cookies. Instead of chocolate chips, we added shredded carrot (bunny food! ), a bit of shredded coconut, and some pecans (for crunch). 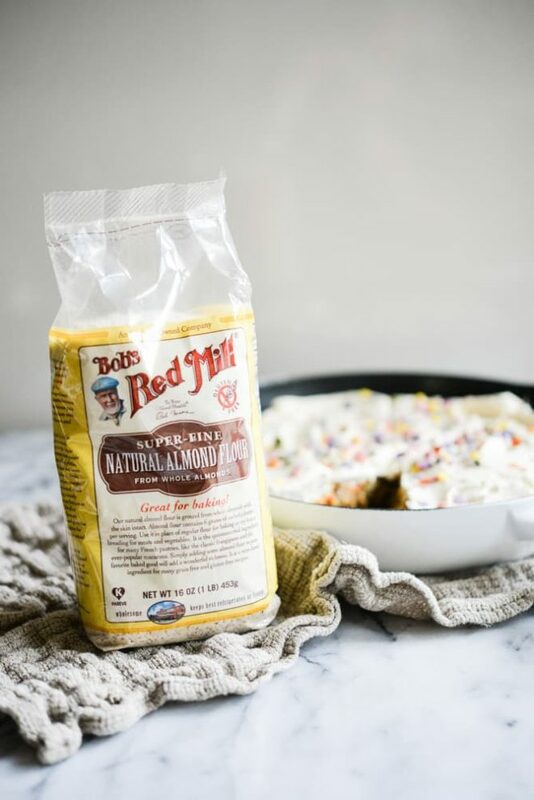 My go-to almond flour is this Superfine Almond Flour by Bob's Red Mill (the natural or the blanched will work). 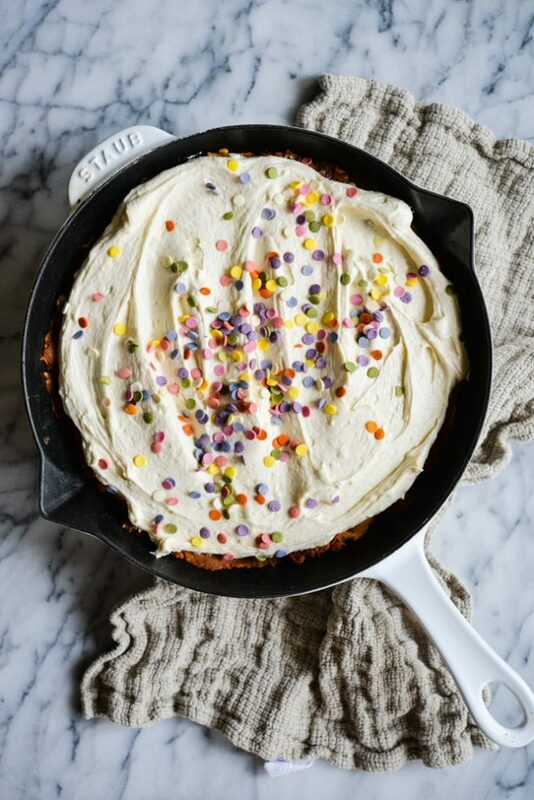 The cookie is pressed into a greased skillet and baked to perfection. Note that this cookie does NOT spread. It'll finish in the same form that it starts at. 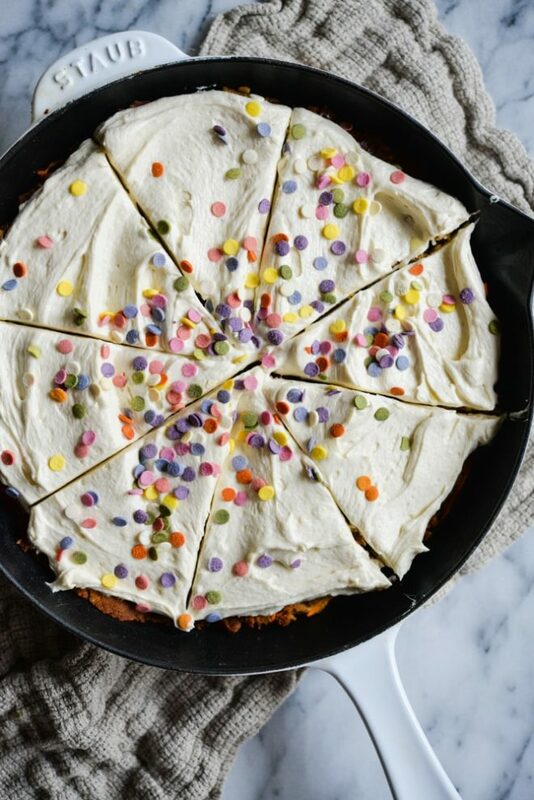 After the Carrot Cookie Cake cools, you can add the DANG TASTIEST frosting (ever) to the top. It's a traditional cream cheese frosting made with just 4 simple ingredients! Note that if you tolerate butter, but not more intense forms of dairy, you can make it like I did and use the Kite Hill Dairy-Free Cream Cheese! It tastes like the REAL DEAL. If you do tolerate (and enjoy) dairy, real-deal cream cheese works, too. Lastly, know that you can make it completely dairy-free by using both Kite Hill *and* ghee instead of butter. Note: this frosting is made (traditionally) with powdered sugar. I have not tried any substitutes because I, personally, eat frosting so infrequently that I'm happy to make a more traditional, smooth and sweet, batch. 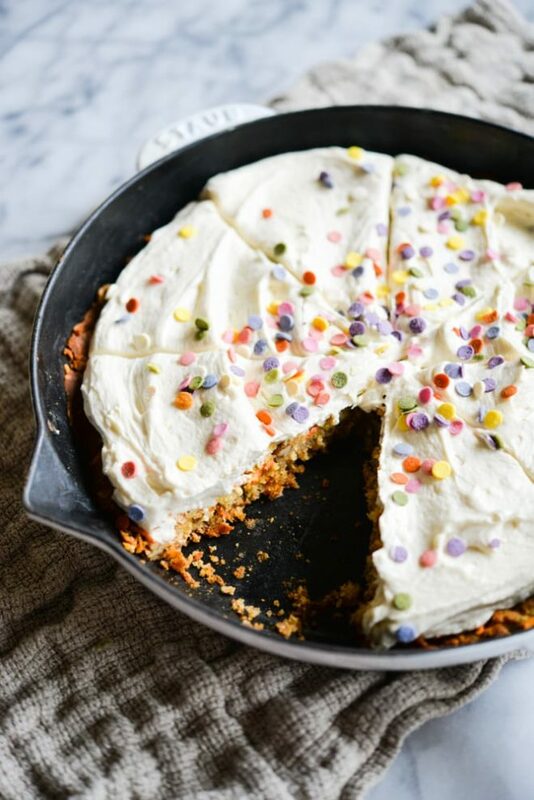 The smooth and creamy cream cheese frosting is spread over the carrot cookie cake and then I topped them with these fun naturally dyed sprinkles! 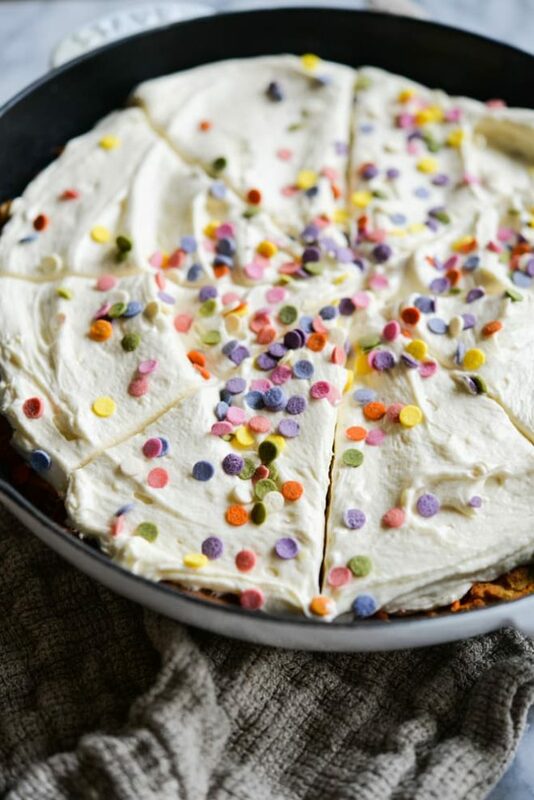 I hope you love this Easter Carrot Cookie Cake as much as we do! Lightly grease a 10-inch cast iron skillet, or other 10-inch round baking dish, with butter or coconut oil, or line with parchment paper. In a large bowl, thoroughly mix the almond meal, salt, and baking soda together with a whisk. In a medium-sized, microwave-safe bowl, microwave the honey and butter for 30 seconds to liquefy them. Let cool slightly, then whisk in the vanilla extract and egg until fully combined. Stir in the shredded coconut, pecans, and shredded carrots until fully combined. Form the dough into a ball and press down into the cast iron skillet, making sure it is even. Bake for 20-22 minutes until the top is golden brown. Let cool for at least 1 hour, then frost and garnish with sprinkles. Beat the cream cheese and butter on high until a creamy consistency is achieved. Add the powdered sugar to the cream cheese mixture, then beat to combine. Add the vanilla, the beat to combine. Click here for a Paleo frosting option. Thanks for the great recipe! What size cast iron skillet do you recommend? Would a ceramic skillet that can go in the oven work as well? If you don’t have a skillet, could you just use a baking dish that can go in the oven? 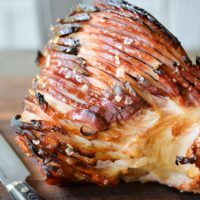 Do you suggest making this the same day you are serving it or if you made it the day before what would be the best way to store it (I.e. refrigerator?)? If you make it before I’d cover and refrigerate it! If you make it on the day of make sure you leave enough time for it to cool. What if I only have an 8 inch and a 12 inch cast iron. Which would you suggest? Thanks. Either will work, but I’d go with the 8 inch! If you go with the 8 inch the cookie will be thicker so it may need to cook slightly longer. With the 12 inch it would be thinner and possibly need to bake for a shorter amount of time. 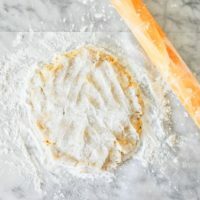 Could you use whole wheat flour instead? I have a nut allergy and plan to omit the walnuts too.